Stick n Click, quick and easy light anywhere. Stick n Click, quick and easy light anywhere. 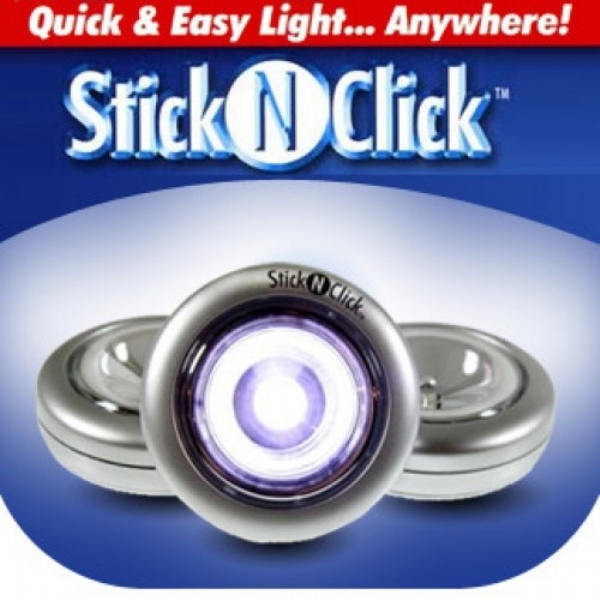 Stick and Click as seen on TV, the battery-operated peel and stick LED lights. Now 30% brighter! Enjoy bright white light wherever you need it fast, easy and without tools. These compact yet powerful LED lights install in seconds just about anywhere you need light. Up to 100 hours of light on a single set of batteries. Plus, you can remove it from the base so Stick and Click becomes a handy flashlight. Just peel, stick and press to turn on and off. It&apos;s that easy. Requires 3 AAA batteries (not included). I must say I was impressed with the lights, they cover a wide enough area in the closets and they look good. Will buy again. They work great in the trunk of my car. Pretty bright for some Chinese made plastic lights. This is an initial review, so no idea how long they will last. But one complaint I do have with them, is according to the package, you can slide them off of the base for use as a flashlight. But when you take the base off, the batteries pop out. There is nothing but the base itself holding them in. Otherwise I am very happy with them. I&apos;m thankful now that I can see when I&apos;m using my mixer. It is on a small counter and no direct light up above. It is stuck on the underside of my cabinet. Not in the dark anymore! The second one I put directly above my toaster and can opener. It is stuck on the underside of my cabinet. I purchased the Stick n Click for my closet and I love it! The light is super bright and great for use under cabinets and in closets where light is needed. I ordered this product to light a step in our kitchen that guests had mis-stepped a couple of times. To avoid any injury to anyone I placed 2 lites on the back of the step. They appear to be working great! The lites are definitely bright enough to light the step. My only complaint is that they kept falling off due to the adhesive backing being too small. I remedied this by applying hook and loop tape the entire length of the back of the lite. It is very inexpensive. I would definitely order more of these lites for different purposes. Used them for a part display case. I put these up in places that I use at night-time instead of turning on house lights. Works great. Definitely recommend for places without lighting and/or places just needed for short term times. This is perfect for under cabinets where you need extra light.